GBA Mario Pinball Land (JPN) in 07:21.22 by MUGG. Super Mario Ball (スーパーマリオボール), also known as Mario Pinball Land in the US, is an adventure quest combined with a pinball game, similar to Pinball Quest. 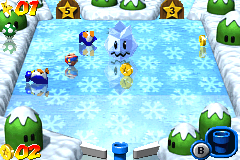 In the game you need to flip Mario like a pinball to obtain stars and keys, defeat enemies, and advance levels. Of course the author completes these objectives with speed and precision and often while juggling multiple balls. MUGG improves the previous movie by 40.48 seconds, thanks to abuse of the game's Save & Quit feature and overall better optimization.